Peppers The Sands Torquay offers a premium golf resort accommodation experience, just moments from the beautiful beaches of Torquay. Located just one hour from Melbourne and 20 minutes from Geelong it is perfect for a Surfcoast escape.The 112 accommodation rooms feature spacious room layouts, tasteful furnishings and flat screen TV’s. Suites offer separate lounge and dining spaces with premium facilities. 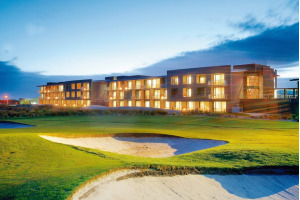 A host of facilities include 18 hole championship golf course and practice facilities, driving range, restaurant and alfresco areas, indoor heated pool and fully equipped gymnasium.